Pour water into a Dutch oven over medium heat. add to water, stir well, and bring to a boil. 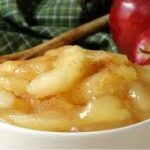 Reduce heat, cover and simmer until apples are tender, about 6 to 8 minutes. Ladle into 5 freezer containers, leaving 1/2 inch headspace. Cool at room temperature no longer than 1 1/2 hours. Can be stored for up to 12 months.